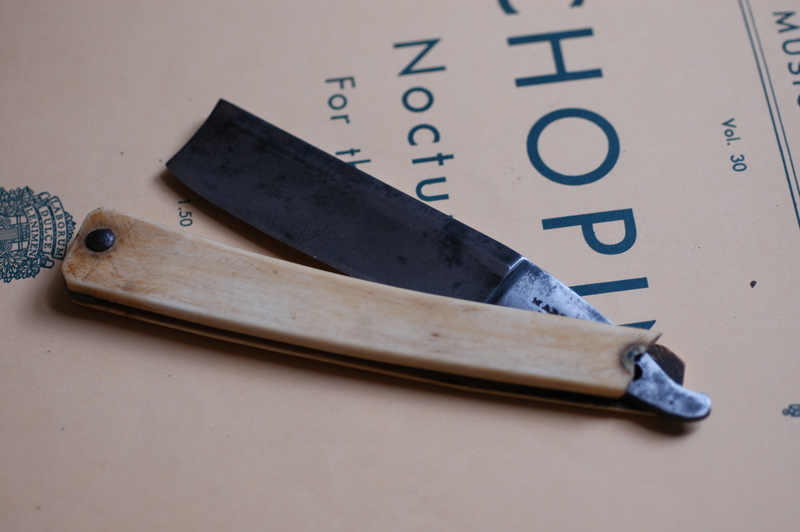 The only fully legible marking on these razors is on the spine: Magnum Bonum1. That, however, along with the distinctive design and the very old strop box they came in is enough of a hint to see that this old newspaper advertisement might hold a clue as to their age. An advertisement from the October 16, 1810 Evening Post, NY. Great is no joke. At a time when most razors were 4/8ths of an inch wide, these are a full inch — 8/8 in razor jargon. More modern 8/8 blades seem smaller because the blades aren’t as long as these. Ironic then that the magnum bonum and refined steel razors are advertized in the same breath, as the one ‘refined steel’ razor I have from the same general time frame is a tiny travel razor — 4/8 and quite short. It too came in a strop box, however. The same sort of hinge and simple lock, the same paper-thin Morocco leather. There’s still no clues about the maker, though. It’s here that eBay comes through again. This razor was listed not long after I got my pair. The scales are very similar, but these are cut from bone instead of ivory, and are much rougher. It suggests they might have been made later to replace the original ivory scales. While this is currently only two points of data, I’ll get to a third shortly — one that suggests ivory is the original scale material. For home-made replacements, these are uncommonly good and quite old. As you can see, it’s overall very similar to the pair I got. 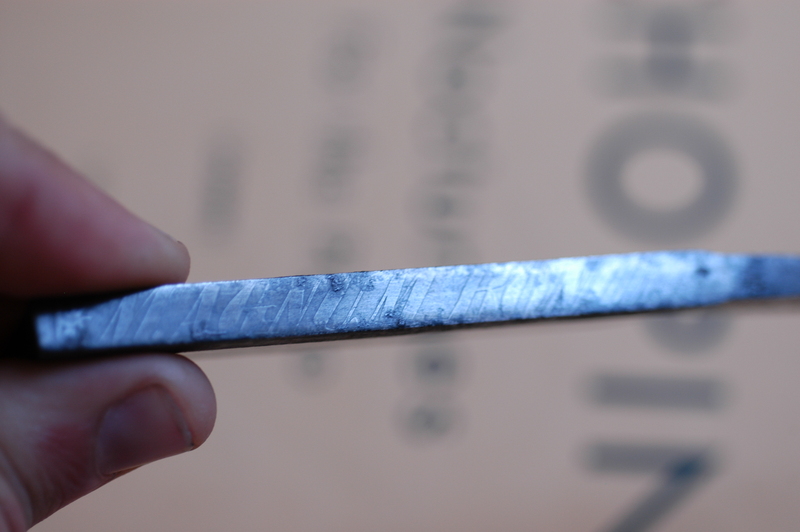 If the extraordinarily distinctive tang and blade shape weren’t enough, it also has the spine etching. Image courtesy of Michael Ghidiu. And finally, even though the tang stamps on both of my razors have been ground down beyond legibility, when compared to Michael’s razor, it’s clear they’re the same make and model. Once linked to a name, you might think it would be easy to to figure out who made all these razors. I certainly thought it would help. But you and I, my friend, we would be so very wrong. A quick run through Gales & Martin turns up one William Marsden, fellmonger and glew maker from Millsands2. But that’s really very unlikely to be our man. A general search of old Sheffield directories3 turns up an incredible number of Marsdens, clerks and farmers, shopkeeps and publicans. The vast majority of them were listed after 1850. But oh, what’s this? 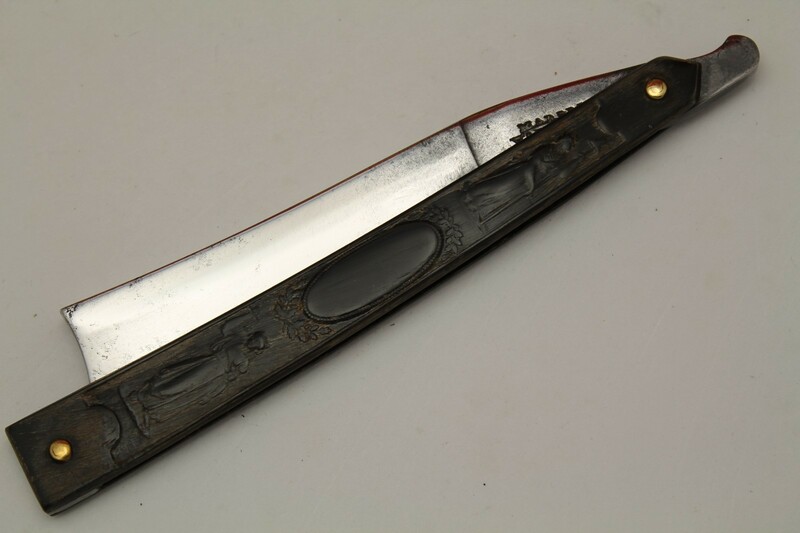 Baine’s 1823 directory lists a Benjamin Marsden, pen & pocket knife manufacturer. It’s not razors, but sometimes there was overlap. Pigot’s 1828-1829 directory has an Ebenezer Marsden, Edge Tool Makers4. Infuriatingly, Baine’s 1823 directory also lists one G. Marsden, razor manufacturer of 21 Meadow Street — an address that would later house James Barlow & Son, who very definitely also made razors. Maybe I’m easily amused, but Henry Marsden, policeman and confectioner delights me. White’s 1833 directory lists a John Marsden Cabinet case, pill machine and surgeons’ instrument case manufacturer, which isn’t completely off base, but probably not right. 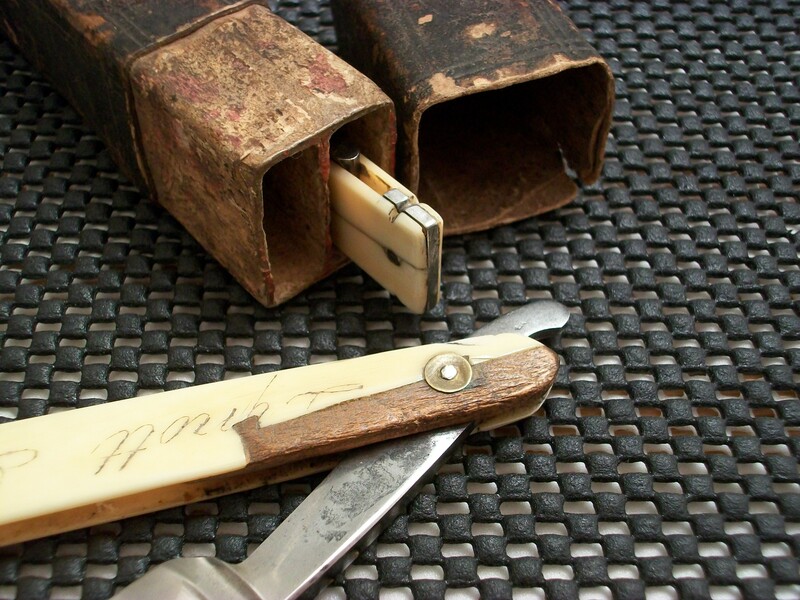 Then there’s a veritable explosion of John Marsdens from the mid-1830’s to 1850 or so, in many different branches of cutlery, including one who made paper cases and razor strops (old razors were often sold in papier-mâché boxes commonly called ‘coffins’). There was a Joshua Marsden making pen-knives, a Samuel Albert Marsden who made table-knives, a Thomas Marsden who made spring-knives and kept shop, a Thomas Marsden listed as a whitesmith5, a William Marsden who made tableknives not far from Wade & Butcher, a William Marsden who made razors and table knives at the same time as the other William Marsden but several streets away on Hoyle street, another on Burgess street – the same year, another on Ellis street, and finally one more on Thomas Street. All William Marsden, all making some kind of knives. Of all those men named Marsden, there are only a few likely candidates. That G. Marsden of 21 Meadow Street and William Marsden on Hoyle Street. William is a bit late, but isn’t out of the question. He might’ve been a journeyman who occasionally struck his own mark and only fully branched out late in life. However, the directories aren’t the only source of information, as good as they are. There’s also the apprentice rolls of the Company of Cutlers, and that turns up another enormous quantity of Marsden. 54 separate boys all apprenticed into some branch of the cutlery trade from 1731 to 1810. 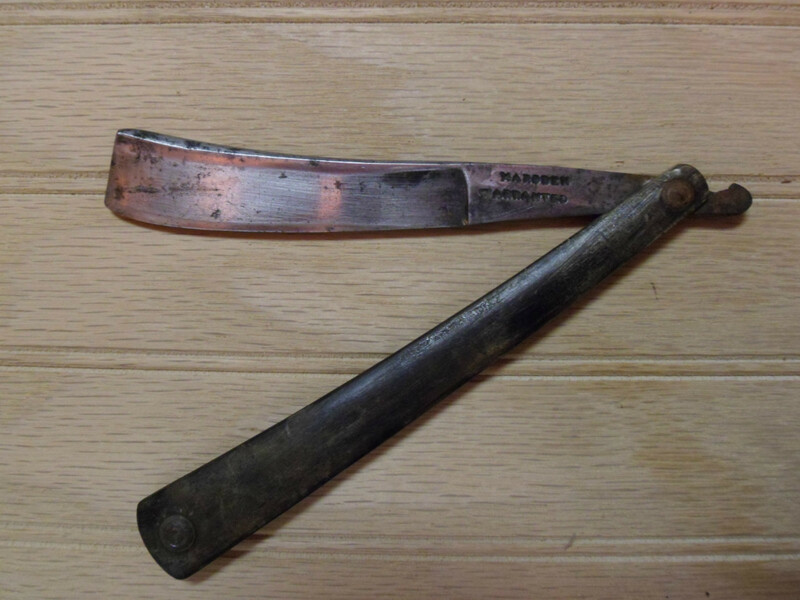 From items that have gone through eBay, I know that Marsden — whichever one it was — had been making razors since the late 1700’s. Photo courtesy of Jerry L, from Rhode Island. Apart from that one, I’ve seen one other stamped with Acier Fondu, suggesting it’s even older. Based on that, even Marsdens operating in the early 1820’s are possibly too late in the game. But I don’t think the set I got is from the late 1700’s, based on the newspaper ad above, and the additional evidence of another pair that was sold on eBay. 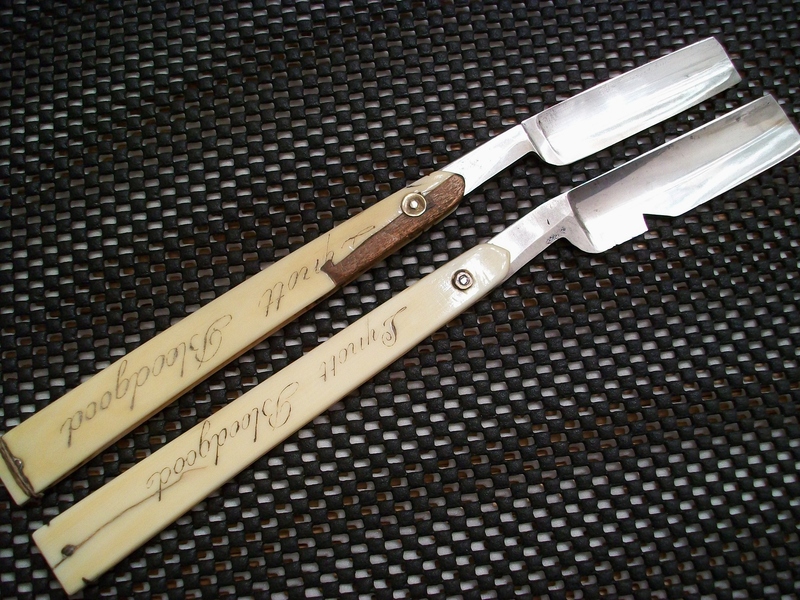 A pair of razors, heroically repaired many times over the decades. Image courtesy of Quinton Boyle. Image courtesy of Quinton Boyle. Sadly, these blades were reground thin and one broke, but they still stand nicely as an historical testament to their owner. Image courtesy of Quinton Boyle. The heroic effort to save the scales is quite similar to the pair I have, which also used wood to shore up cracked ivory. Lynott Bloodgood was a silversmith working in Utica, New York6. He and his brother James formed a partnership called J&L Bloodgood which ran from about 1804 to 1810, when they went their separate ways. Lynott was born on Christmas 1781, and James in 1778. You’re probably thinking that Lynott is a somewhat strange given name. It is. He was named after his mother’s first husband, Thomas Lynott. That, of course, adds a little to the strangeness. But his father, Abraham Bloodgood, was a member of the first Masonic lodge in Albany. His wife, Elizabeth van Valkenburgh had previously been married to Thomas Lynott, Grand Master of the same lodge, a lodge which included several very prominent silversmiths. All very tight-knit, yes? 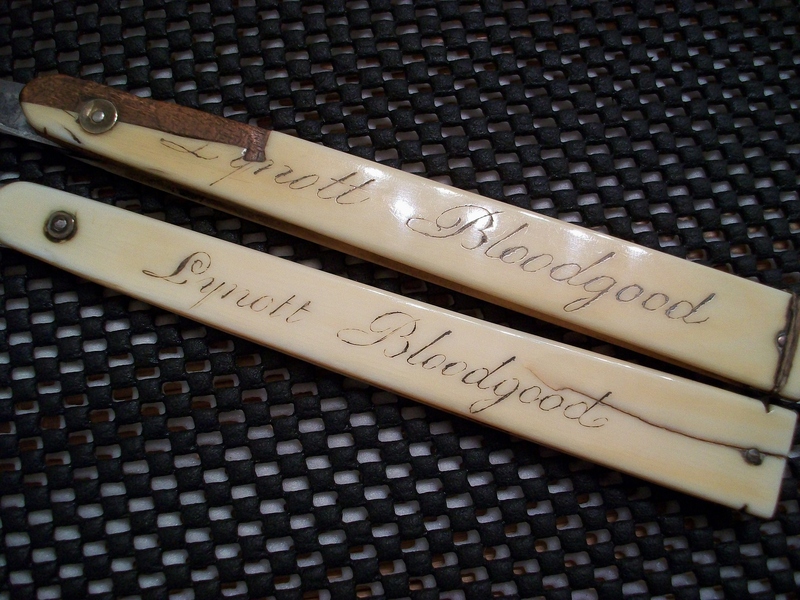 In any event, the Brothers Bloodgood went on to have long and distinguished careers as silversmiths. James died sometime before 1860 and Lynott June 17th, 1856 in Enfield, Connecticut. For whatever reason, the elder brother left considerably fewer traces. It could easily be argued that Lynott bought these razors for himself later in life. 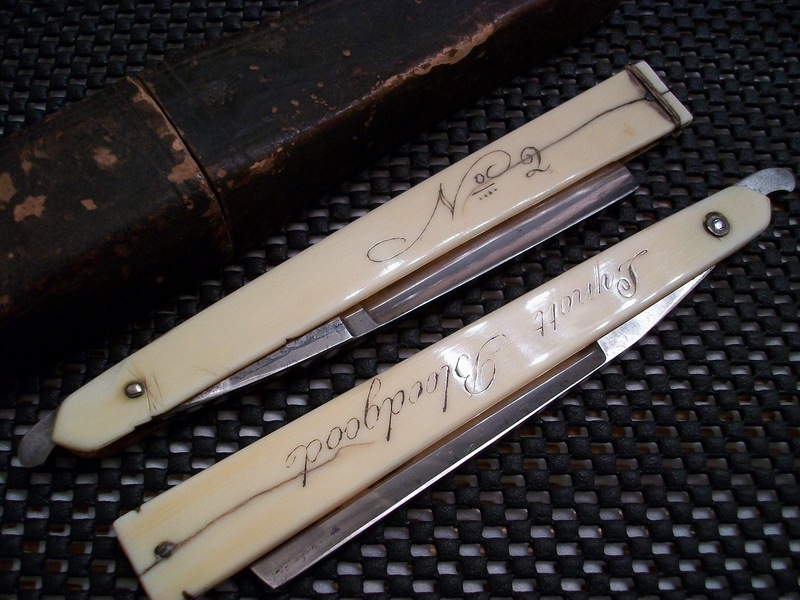 But put all together, there’s a window of data around 1810 that I feel is a pretty good indicator that these big ‘Magnum Bonum’ razors were made by a Marsden sometime around 1810. The great volume of historical Marsdens is more than a little haystack-like to find this particular needle, but a couple options are sharper than the rest. Tantalizing possibility number one is from Leader’s History; in 1795 the Company fined a number of individuals for producing works with their name stamped on them without having completed an apprenticeship. One of those fined was Benjamin Marsden. More likely possibility number two is one Robert Marsden, listed in the apprentice rolls as a razor maker, and having taken several apprentices. The third and final possibility is the mysterious G. Marsden, most likely George. That he set up shop at the same address as a later, well-known razor maker is suggestive. 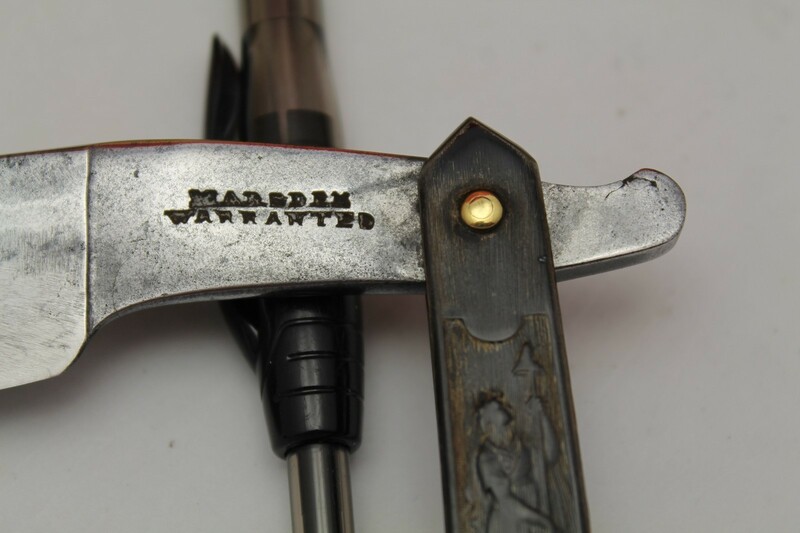 Clearly the Marsden who made all these razors had some capacity to produce quality goods in quantity. 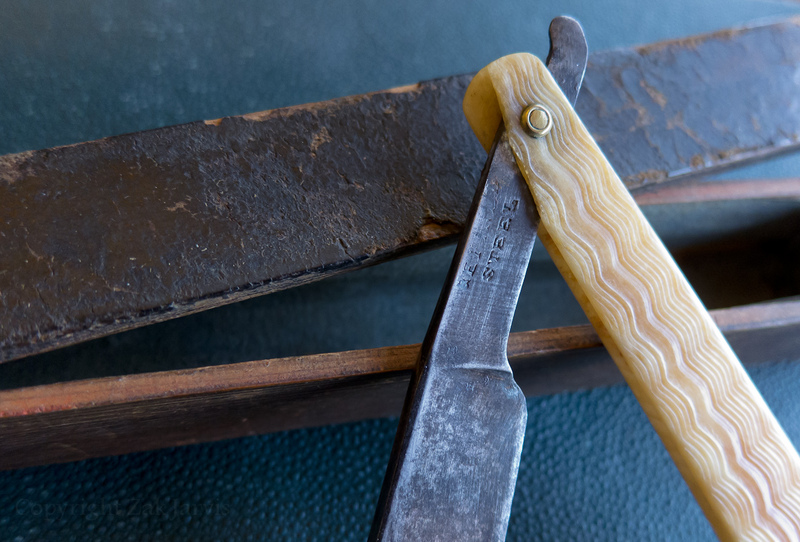 It’s not unreasonable to assume only a very small percentage of the razors that were made have survived today, and the percentage gets smaller and smaller as you go back in time. 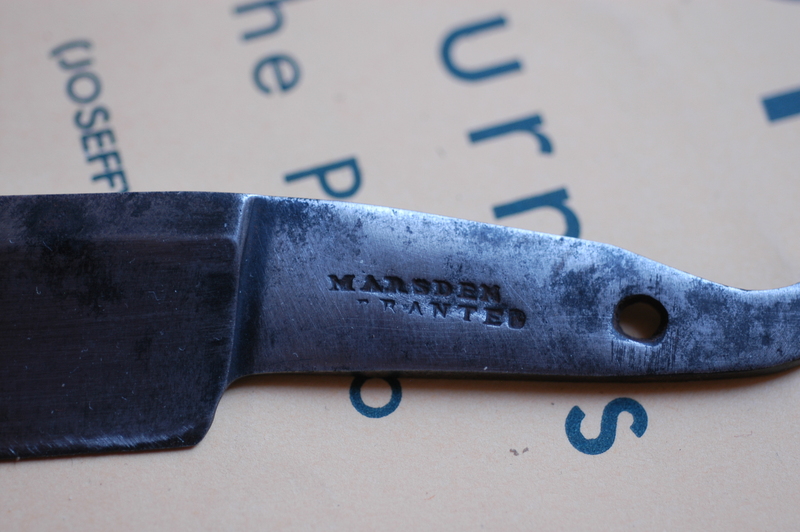 So this Marsden clearly made a lot of these razors. And these razors were loved by their owners. 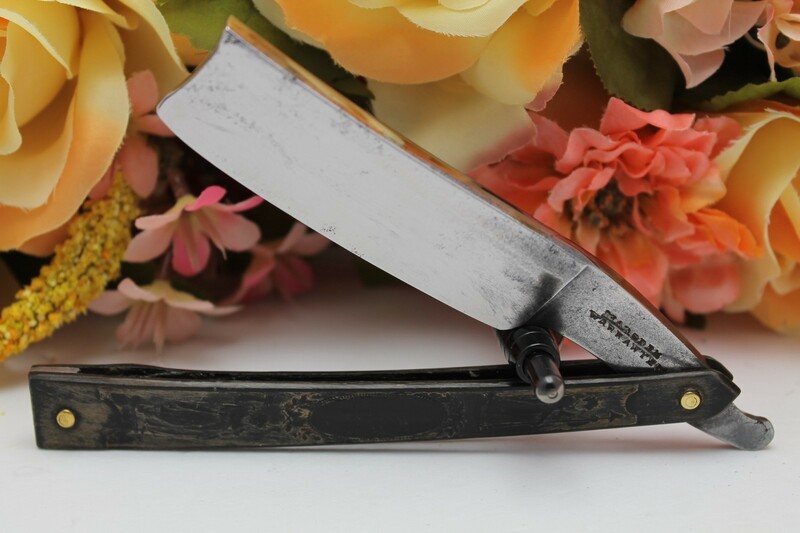 Five razors from three sets of Magnum Bonum and all of them have had the scales repaired. The two complete sets were both reground. Were they used by generations, or individuals? I don’t know and I have no way of knowing. The pair I bought were sold through one of those ‘Sell it on EBay!’ storefronts in Minneapolis, and the shop vendor said the customer didn’t know anything at all about them. The Lynott Bloodgood pair did come from upstate New York, so there’s still that tiny connection to their history. Personally, I like to think they were made by Benjamin Marsden without the approval of the Company of Cutlers, but that’s me being fanciful. There’s no more evidence for that than there is evidence that they were made by the George Marsden who was a prominent figure of the Revolutionary War. Far more likely is that they were made by the George Marsden of 21 Meadow Lane (who I like to think was the son of Robert Marsden, but again that’s wild speculation). Come to think of it though, perhaps these Marsden blades were trading on the importance of George Marsden, friend of George Washington, who famously switched sides during the war, seen as a local patriot, and buried now in Oneida, New York. So there you have it. Marsden is a bit of a lineage swamp to wade through, though not as bad as Wade! Image courtesy of Bob in Ohio.